We guarantee quality driven repair service for your garage door problems. If you find that your garage door is in need of repair, and that you are savvy enough to realize that it is far too dangerous to repair it yourself, then you are probably considering hiring a repairman. 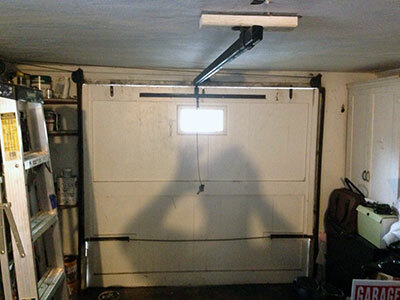 We understand that not everyone is entirely willing to put all of their trust in professionals, so in order to give you piece of mind, we thought we would educate you on the basic steps of garage door spring repair, so that you can verify that the professional is doing his job. Read on and find out more, starting with overall checks and small repairs and onto the springs. The repairman will start by unplugging the door opener and removing it from the door itself. This will result in the door being stuck in the open configuration. He will then do some sniffing around, checking for any damage to cables or rusting at attachment points. He will then set his eyes upon the track and look out for any deformation or indicators of age. He will repair and replace them if necessary. The next thing on the repair list is checking the garage door cable in its entirety. It may need to be replaced. All of the rollers will then be check and repaired or replaced according to the repairman’s judgement. He will then do the same thing for the end and center bearings and if he is satisfied, he will check all fasteners and tighten any loose ends. He will then apply a lubricant to all moving mechanisms on the door so it all runs smoothly again. If all is in order, he can skip right to the springs. If the springs are not adjusted or have too much or not enough tension, he will carefully adjust them. If, however, they are broken – there is no way to replace them and they will need to be replaced. In this case he will replace both the springs, even if only one is broken. The reason is that since the springs support the entire weight of the door, the spring that isn't currently broken had suffered significant damage, taking the weight on itself. You wouldn't want to find yourself facing the same issue in a week or a month from now would you? No one would. After the replacement, the technician will reattach the door opener and it is all done. For safe troubleshooting, repair and replacement, you can always count on us at Garage Door Repair Plant City.